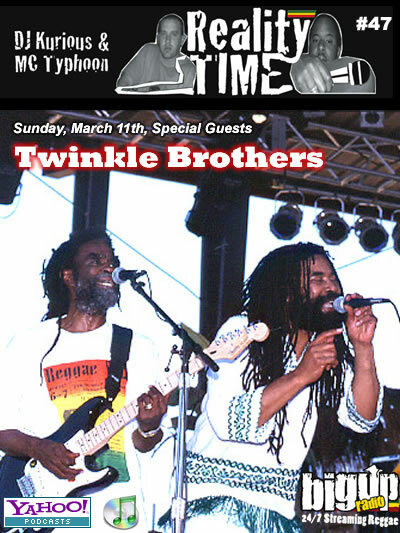 The Twinkle Brothers hail from the north coast of Jamaica in the ghettos of Falmouth, the Parish of Trelawny. The two brothers, Norman and Ralston Grant, were baptized in the church of Anglican Diocese. They started singing in the Sunday school choir and concerts at the age of six and eight respectively. At that time they started to make their own instruments since they could no afford to buy them. They made guitars and drums from various tin cans (garbage can, sardine, milk, etc.) and fishing line. After Jamaica received her independence from England in the early 60’s, the Twinkle Brothers started to sing in real competitions. At that time the government of Jamaica started National Competitions called "Pop and Mento" festivals. In these competitions you would start at Parish level, then go the regional level. If successful there, you move on to the National finals. For years the Twinkle Brothers were Parish champions, then went onto the Regional finals where (according to the crowds and the Twinkle Brothers) they were cheated out of the winning crown for two consecutive years. However, the third time being the charm, they broke the barriers at the Regional finals in Montego Bay, and then went on to the Nationals in Kingston. This time they were victorious, winning first place in the "group" category! Norman won first place in the "solo" category. They reigned supreme for years in that competition coming away with several medals.